Trail Length: 8.6 miles of trails is what we did( My fitbit said 10 miles) and it took us 3:25 hours. But you have lots of options on where to loop it or go on. Degree of Difficulty: It depends on how far you decide to go and the route you take, overall it is moderate. Bathrooms: Only at the trailhead/parking lot and they are flush toilets. I am not positive but they felt heated yesterday although it was pretty cold outside. Pets: Dogs allowed, I believe they are supposed to be leashed but they often are not. This trail has been one of our go to hikes for a long time. It is close to Denver, has beautiful views when it isn’t snowing and gave us the opportunity to work on our stamina in the beginning. We haven’t been there for almost 3 months and at least 18lbs ago, since the weather was going to be bad this weekend it was the perfect time to come visit it again. 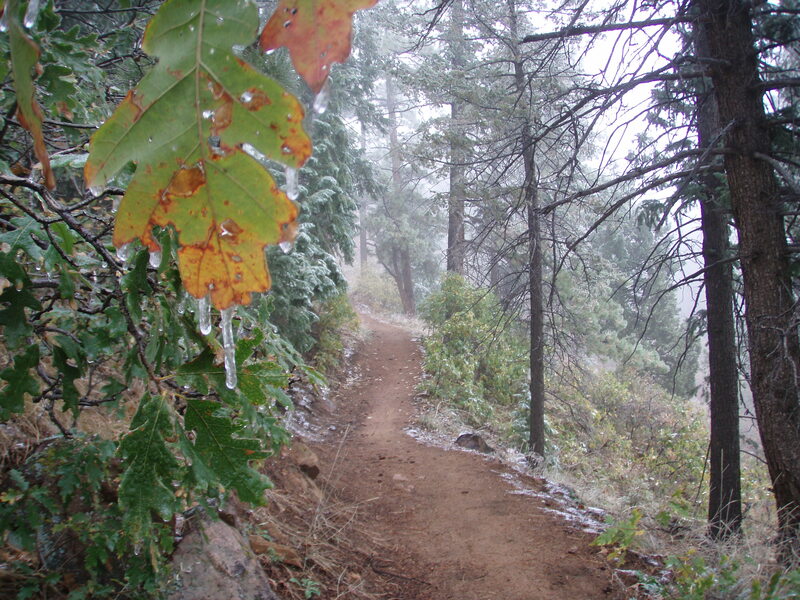 It is a nice trail, not a lot of rocks and when it is wet outside, not as much mud as some other trails might get. Plus you can easily make it challenging by increasing your distance and/or taking different routes to keep you moving up and down constantly. My hiking Idol Wendy, once told me doing this one is a great way to train for more difficult trails because the first 1.6 miles has a steady 10 % grade. 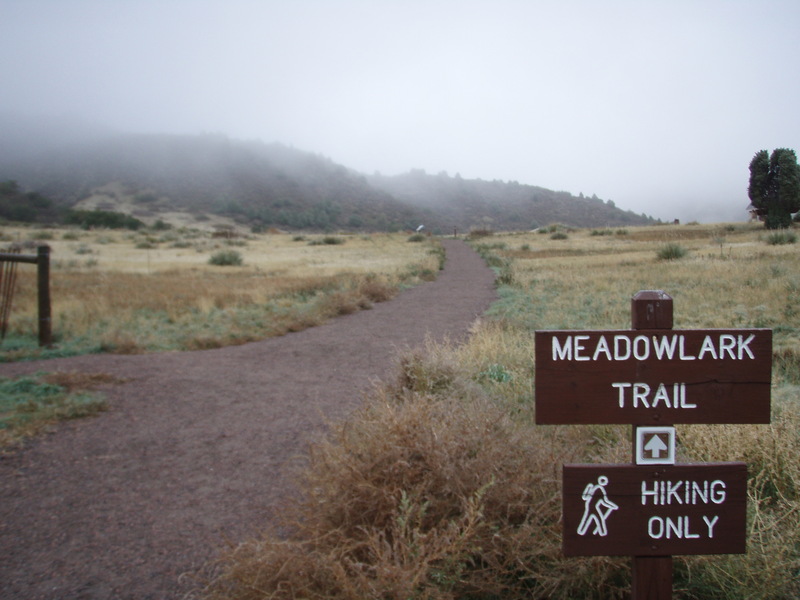 I would always struggle through this first part, get on Meadowlark Trail directly right of the open space sign which is hiker only, my only goal was to try to stop only once to catch my breath until we hit the first turnoff at 1.6 miles ( I think I only succeeded once). As a side note, typically I am pretty excited to share our photos, on this hike not so much. It was just 30 degrees when we started and it was sleeting/ snowing, so we didn’t take our nice canon but our tough Olympus and stopping to take pictures was a cold wet endeavor. We kinda of held our breath and just pointed, clicked and moved on…. it didn’t work out all that well so I am sorry about the blurry pictures I had to use. We went up of course and at the next intersection about a half mile up, you can go left and take switchbacks up to the highest point on the Plymouth Mountain trail or stay straight and tough out the climb all at once, then switchbacks down. We stayed straight so that we could pick up the Homestead trail and get an additional 2 miles of distance. I don’t recommend this unless you are simply looking to get more mileage, its beautiful but normally crowded with runners and while it was empty this time we often would find ourselves stopping and dodging quite a bit. Yesterday though, again we practically jogged it ourselves. 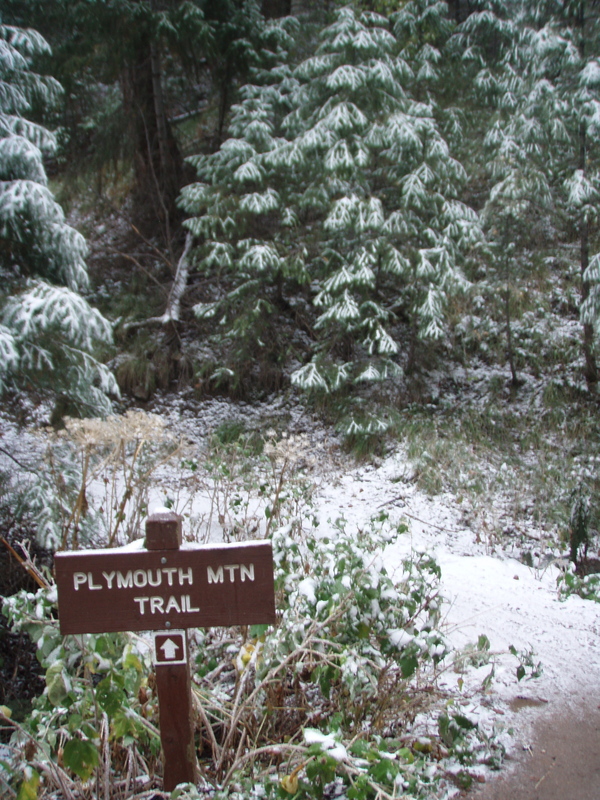 Quickly enough our 2 extra miles were knocked out and we got right to the trail where we left continuing onto to Plymouth Mountain. 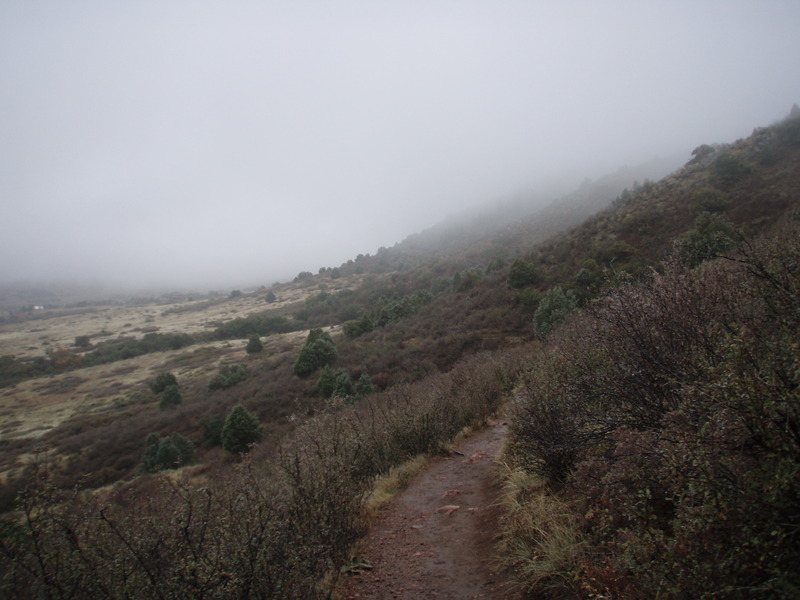 This is a quick loop around the mountain at 1.7 miles and then back down the way we came. We always take the Meadowlark trail back mostly because it is hiker only and in the fall/summer/spring the bikers get pretty intense on the Plymouth Creek trail. I am so proud of us, after all we did this summer and ending with our first 13ner last week, to come back and do this trail so quickly and easily was a wonderful reward! 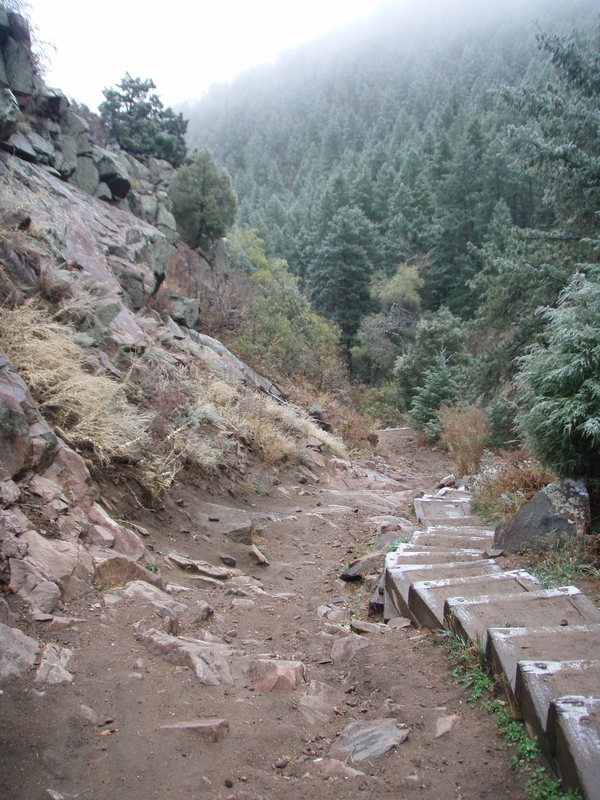 In general this trail is very exposed and HIGH HIGH, SUPER HIGH traffic. We would come here if we could get on the trail by 7:30AM or earlier, a few hours after that and the hike takes on a different attitude. Early in the morning it is veterans who know rules of hiking courteously, after about 11AM you get all kinds and the bikers are typically less nice/patient. I saw a girl hiking it in her bikini one time this summer….a bikini! People in street clothes sweating it out with one small bottle of water and a lady carrying her dog in her purse. And those are just the highlights…. Oh and there are snakes, in fact I saw my first one here, as well as they could be heard all along the trail. Directions: 13896 Grizzly Drive, Littleton CO 80127 From the metro area, travel south on C-470 to Kipling exit. 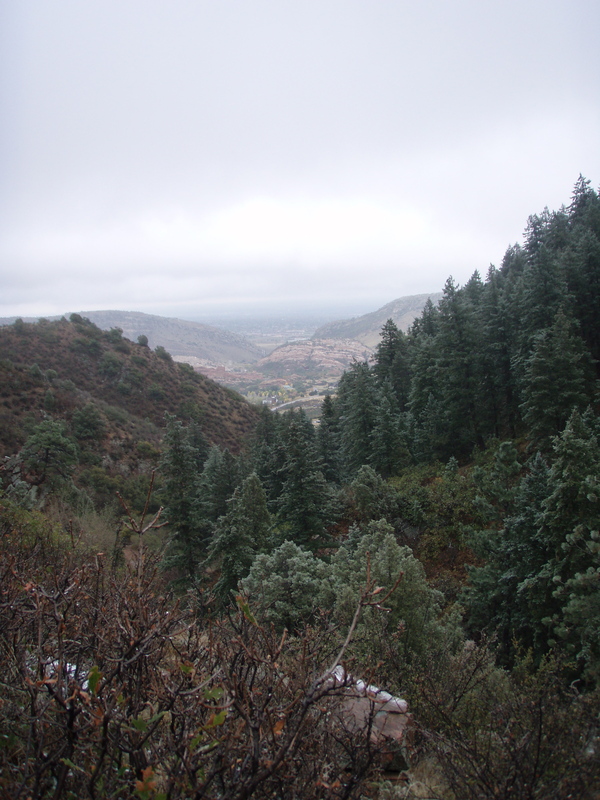 Turn west, (right) on W. Ute Avenue, then west (right) on Deer Creek Canyon Road. 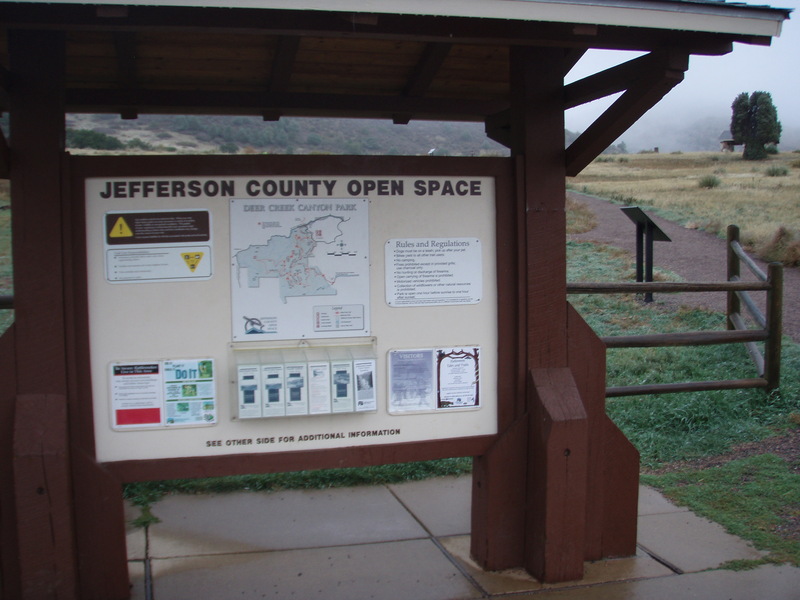 Turn left on Grizzly Drive, then right into Deer Creek Canyon Park. ← Weigh in Day 10/5/12 No Change, still 41.8lbs lost 48.2lbs to go. Snowing already! Here in California, I rode the trail in short sleeves and worked up a sweat in the autumn sun yesterday. I love the trail, any time of year however. Yep! But it is deceptively mild here on the front range, yesterday cold and snowy today sunny and mild, love the weather here! Thanks for stopping by! Isn’t a great feeling when something you once found difficult is now easy?!! Congrats on that accomplishment; you are making progress. 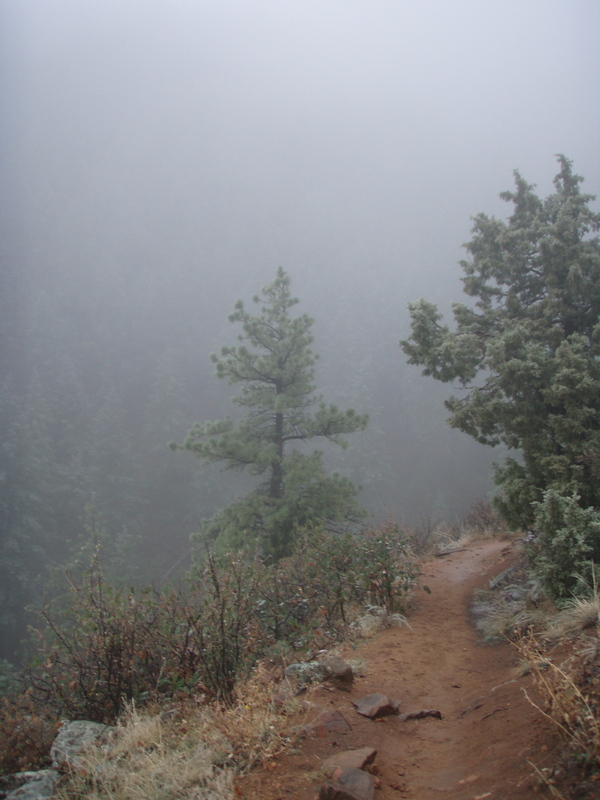 I enjoyed your foggy, snowy pictures, but then I like hiking in fog and snow. 🙂 I also chuckled at your descriptions of fellow “hikers”. Having just witnessed tourist season in a National Park town, yes, you see just about anything. Thanks Carol! It felt really good for something that was once so hard to be so much easier! Thank you! I have one of the most beautiful backyards in the world and I need to be in better shape to enjoy it! Thank you so much for checking out my blog!